TSD 17 2540 rood/wit, 250 x 400 mm. TSD 17 1529 rood/wit, 150 x 290 mm. 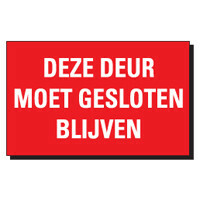 TSD 17 4060 DEZE DEUR MOET GESLOTEN BLIJVEN rood/wit, 400 x 600 mm.